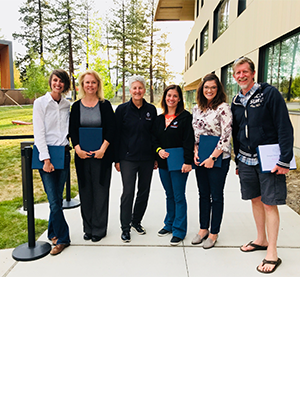 OSU-Cascades 2018 Employee Award recipients with Vice President Becky Johnson (from left to right): Jenna Goldsmith, Donna Harris, Becky Johnson, Tori Howe, Amy Watson and Ron Reuter. Not pictured: Yong Bakos. Note to Editors: Digital images of award recipients are available for download and use with this article: https://bit.ly/2unF4bk.